There is a new Newsletter Editor. A reminder for those who are also members of the Coble and Keelboat Soc. Their AGM will take place on the 21st of October 2017 between 1pm and 5pm at the Duke of Cleveland pub on the Headland at Hartlepool. The Agenda will be attached to the September Coblegram. Plus a little piece on Peggy from their August’s newsletter. 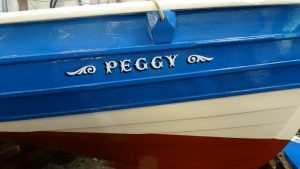 CKS member Paul Robinson, renowned for the quality of his sign writing on vessels of every sort, has put the final touches to the restoration of the coble Peggy at the North East Maritime Trust at South Shields. I wrote to you on 26th March to notify of you of the date of this year’s AGM – Saturday 22nd April – and to invite nominations for trustees. I am now advising you that the trust has received three valid nominations by the due date to be considered for appointment. These are from: Mr Mark Batey; Mr Alex Finnegan & Mr Martin Wilson. Under paragraph 9.10 of the trust’s Articles of Association, I am obliged to give all current NEMT members at least seven days’ notice of any resolution to appoint a trustee at the Annual General Meeting. This resolution will be at item 4 on the agenda, below. 4.2. Trustees to retire (under paragraph 9.7 of the Memorandum of Association) – 1/3rd of the current directors, by seniority – Paul Nicholson and Jerry Dudman. Both offer themselves for re-election and have the support of the board. P.S. If you have received this by post, it is because we don’t have a current up-to-date email address for you. To save the trust the cost of postage, and you have email, please advise me of your address using the envelope enclosed. The editor of the the Coble and Keelboat pages has bought together some fishing interest Youtube videos in one place. Favourite and Rachel Douglas feature. 1. Be sure that it can keep the items safe from theft, weather, fire. 2. Be able to protect the item for a long term of very many years. 3. Know that title (ownership) is with the Trust, or some other body or person – provided that if they retain title they guarantee and prove the item to be free from threat of destruction or damage or disposal to an insecure home. 4. 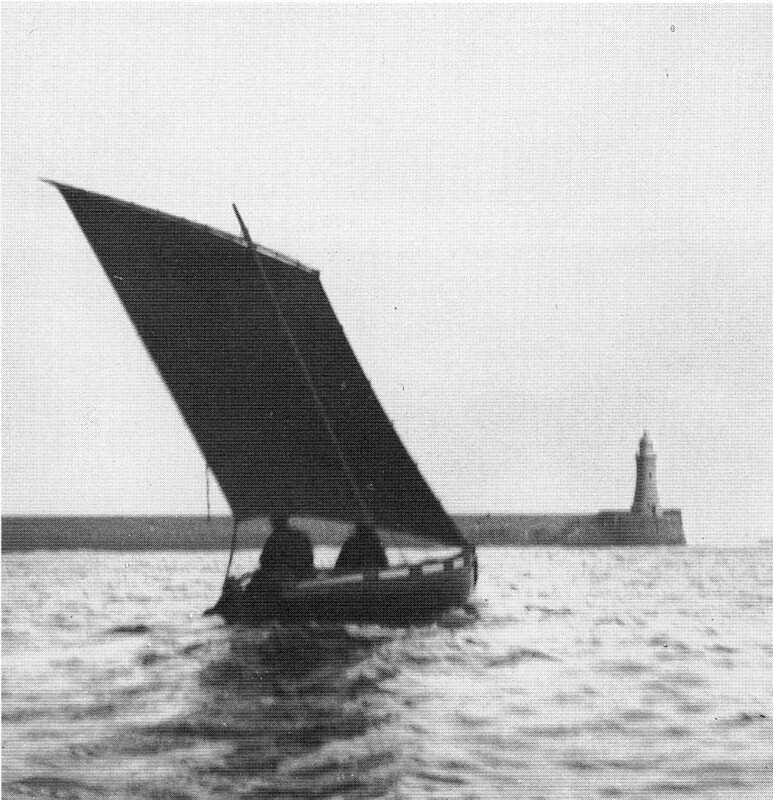 Know that the item has relevance to the Trust’s core objectives which broadly relate to north east maritime heritage. 5. Know that through acquiring a particular item no future acquisitions will be threatened through space (and other resources) having been consumed by this item. 6. Be certain that the cost of acquiring and protecting an item is equitable to its importance. In furtherance of the above the Trust will consider whether the protection given to any item offered to it, is sustainable; if not, the Trust will look at alternative options elsewhere and if none is available it may be necessary to reluctantly decline the acquisition of the item in question. 1. Name and address of donor or lender. 5. Any protection and maintenance requirements. In addition to the above, it is desirable to add an assessment of the item’s history/relevance/rarity/vulnerability/importance. It is also desirable to record any conservation/restoration undertaken. A key part of the trust being able to take our boats onto the water for trips on the river and further afield lies, of course, with the renovation and maintenance of our existing ‘fleet’. As you will no doubt be aware, we have three major projects underway at the trust at present – each with a variety of demands on volunteer time and expertise. 1. The lifeboat Henry Frederick Swan under the direction of Tim West has been our main project for several years now, and is beginning the final stages of what will be a fantastic and important piece of heritage restoration. Several of you continue to work on her on Tuesdays, Wednesdays and Saturdays and we are very hopeful of a launch date in 2017. 2. Our boat-building classes are held on Monday and Thursday evenings and you may have seen progress recorded on our Facebook and Blogs. The boarding boat ‘Cygnet’ is our first new-build and we have laid the keel and major stern pieces ready for a recently purchased Stuart Tuner engine to be fitted. 3. 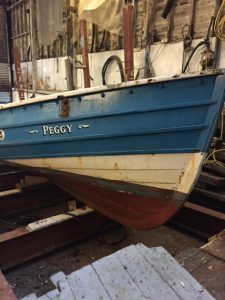 Finally we have taken the sailing coble ‘Peggy’ up the slipway into our boatyard for assessment and repair under the direction of Dave Parker. She is one of the oldest cobles still afloat and is in need of some timbers to be replaced before a complete repaint. When finished she will again be a key asset and favourite among the public. We intend to restore her to her previous glory, but as you can see she is in need of some urgent work. If you are interested in working on any (or all) of these projects then please come down to the yard on Tuesday, Wednesday or Saturday for Henry Frederick Swan, Monday or Thursday evenings for ‘Cygnet’ and get in touch with myself or Dave Parker if you would like to help with the work on ‘Peggy’. 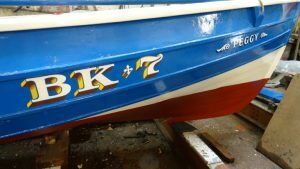 For each of these projects it would be brilliant if you are a heritage boat building specialist, but if – like most of us – you have few or no skills but an interest in learning and getting hands-on experience of a dying art, please get in touch or come down. You’d be most welcome! The site counter stood at 747401 when it was transferred from the old counter on 18th October 2016. It had been running for 7 years. A blog steam for the new build ‘Cygnet’ has been created. This is the tender for the Henry Frederick Swan and is being built on the mezzanine in Fred’s shed. It would be best if anyone who who wishes to be become a regular contributor to apply for a user login ID which you can do through the contact on this site or clicking on the comments/reply fields in cygnet. Better still come along on a Monday or Thursday evening and ask for Mark.